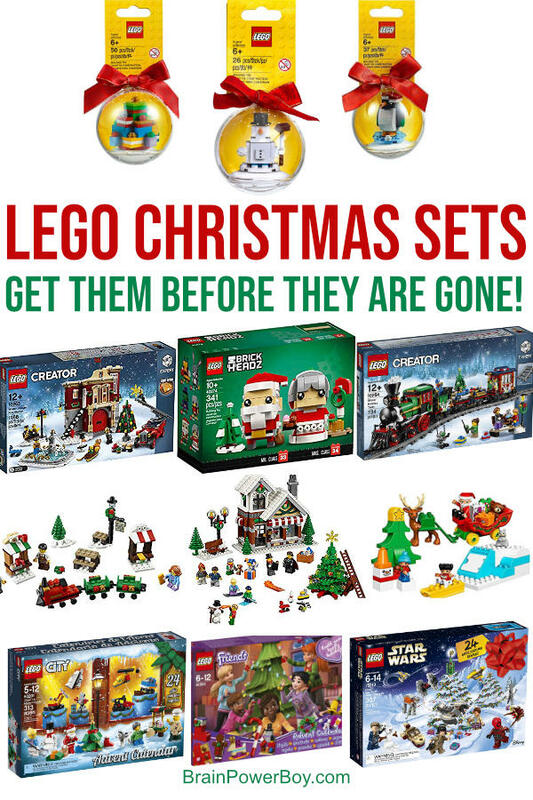 New LEGO Christmas Sets for 2018 Get Them Before They Are Gone! So many people get LEGO for Christmas that I thought it would be fun to highlight some actual New LEGO Christmas sets! For those of you who always end up buying LEGO for Christmas, these are a nice change from the regular building kits. Here we feature the currently available sets that have a holiday theme such as villages, trains, Christmas trees, Santa Claus and more . . . all done in LEGO! What fun, right!? We picked out the best sets for you so you didn’t have to hunt around. See more on our big LEGO page. They are festive, they are fun and they are perfect for gift giving! Take a look at all the new LEGO Christmas sets for 2018 and a few that are still available from earlier releases. Keep in mind if you see something you like be sure to buy it right away. Quantities are limited and prices go up when there is short supply. Let’s start out with a set that is just right for the younger kids.This LEGO Duplo Santa’s Winter Holiday set is so cute, isn’t it? There is a sleigh that is easy to move because it is on wheels. The sleigh has a Duplo Santa and gifts in it. Plus, it is pulled by that adorable reindeer. The blue and white object is a snow hill. There is a video on Amazon showing the set which is how I figured it out. You can push the sled down the hill! This one was released earlier but was still available when I wrote this post. Newly released this year is the Mr. & Mrs. Claus BrickHeadz set. Oh my gosh, but it is a winner. I just love it. What do you think? Look at all the great accessories! I am linking to two places to get this one. Check the prices to see which one is best. Check price on Amazon – it is going up and down. If Amazon decides to sell this one it will likely be cheaper here. Check price on LEGO Store as well because if you can get free shipping, and spend a certain amount, they may throw in a small seasonal set (depending on the offer at the time you click) which is always a nice bonus. There are three LEGO Advent calendar sets this year. A Star Wars set, a City set and a Friends set. Pick the one that you love or that will be the best choice for your LEGO fan. Star Wars Advent Calendar – Star Wars fans will need to get this one. Friends Advent Calendar – The Friends set actually has some great Christmas items in it this year. City Advent Calendar – This is always my favorite set. This year it comes with a Santa minifig! << this set has been dropping in price lately. Keep in mind that especially with the LEGO Advent calendars, the earlier you make your purchase, the better. Each year LEGO releases a new LEGO Christmas Village set. This year’s set is a winner and the reviews on it are wonderful. These sets are expert level sets but really it is just because they are so big. Taking one build at a time, a child can build these. Introducing . . . the LEGO Winter Village Fire Station. The Creator set is full of great features. You can go through the whole slide show here and check the price. Also check Amazon to see which is less. I think the fire engine is my favorite piece and it looks very fun to build. Of course, the Christmas tree is pretty darn neat as well. Overall it is a great addition to the village sets. Whether you only get this one because you have a fireman fan on your hands or you get it to go with all of your other sets, this one belongs under the tree this year! UPDATE: Now retired but still available – at the time I updated this post there were 13 sets left on Amazon. This LEGO Winter Toy Shop is perfect on its own or as part of a Christmas village. Just look at that shop! It is so neat!! The accessories are wonderful as well . . . the tree with the ladder and star, the lights with the wreath, so many great details. What I love best about this set is all the minifigs. There are carolers, a boy with a teddy bear, one is even building a snowman and more. 8 minifigs in all. The level of this set is expert and it has 898 pieces so it is a big one. Add this to your LEGO collection today! We really can’t have an article about LEGO Christmas sets without including trains! The Winter Holiday Train is a sight to see. It comes with an engine, two cars and a caboose. Included are 5 minifigs for plenty of display setups or play opportunities. It also has top notch accessories which you can see here. It wouldn’t be a train without the track, and 16 curved pieces are included. You can make a circle with them or have it going straight across. Don’t miss this one! UPDATE: This one is still available but there were only a few left at the time I updated this post. If you don’t want to go all out for the expert train set above, or you have a younger builder, you will like this mini train version. The Christmas Mini Train Ride is a great stocking stuffer for kids of all ages! With 169 pieces and plenty of Christmas cheer this set is just right. It even has a built-in gift tag on the box. What a fun set for the holidays. There are three new ornament sets out this year. These are small sets that are built to go inside a plastic ball ornament. These would make nice LEGO stocking stuffers! <<< see our post with more ideas. Again, I am adding links for both Amazon and the LEGO Store so you can see which price is the best. I hope you found the new LEGO Christmas sets you were looking for. I will keep updating this list every year with the new sets, so be sure to bookmark or save this article so you can find it again.Thanks for stopping by – Happy Building! If you need more LEGO gift ideas, see these guides! FYI–Amazon prices on the Lego Ornaments (snowman & reindeer) were more than double what the Lego Store charged including free shipping. Sorry for the late reply, this slipped past me. I appreciate you letting me know about the LEGO Ornaments. Amazon’s prices go up and down. If they are out of stock on something, 3rd party sellers are there to fill the gap and the prices rise. I added in a link to the LEGO shop as well so people can check prices at both places. The LEGO shop has free shipping around Black Friday but otherwise they charge for shipping unless it is over a specific amount. I appreciate your comment. I want you all to find the best LEGO deals possible.